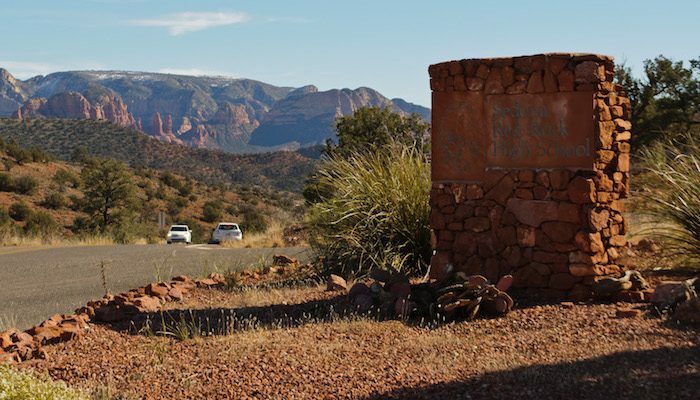 This is a great opportunity to see some of Sedona’s famed red rocks and enjoy gorgeous vistas but on a paved surface. The 8.5-mile paved loop is sometimes utilized by the Sedona Road Runners as a group training run. It has some tough, steady hill climbs and mostly enjoys a wide shoulder where runners can look out upon the vistas of Red Rock State Park. One of the highlights is the the gorgeous view from Lovers Knoll, just after the 7-mile mark. Most visitors start out where the Upper Loop Road meets with Arizona State Route 89A. The Red Rock High School Stadium is a good place to park. Head west on the Red Rock Loop Trail, behind the north side of the stadium. It meets the road on the west side of the loop after about 1.75 miles. Continue along the shoulder of the road through the neighborhood and up past the Pyramid Mountain Trailhead. It returns to the high school after a challenging ascent up a rocky knoll. The route can also be done in reverse, but you end with a hill climb either way. Note: You can shorten the route by using the Scheurman Trail, which bisects the loop, but it’s a more rugged and remote option.